Throwing a kids birthday party should be a lot of fun for everyone. All it takes is a bit of planning and, of course, cracking birthday cakes. Here are our top tips for the perfect party. When it comes to party time, it's easy for parents to stress out and blow out the budget, but throwing a birthday party for your child should be fun for all. It just takes planning, a well-paced party schedule and a brilliant birthday cake. The best place to start with any party is with a theme. Once you have a theme in mind, it opens the doors to a huge world of options, from food to decorations. These little details are what make the bash something really special. Maybe ask your children to help you to create some eye-catching invitations to give your guests a taste of what’s to come. A hand drawn invite will definitely stand out on the fridge and will set the tone for the good times ahead. Keep the offerings simple. 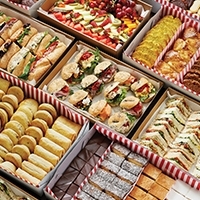 Party pies and sausage rolls, cupcakes, crisps or fairy bread always go down well. But it is also good to keep any party theme going, for example 'AFL Cupcakes' (order a range of cupcakes so that your guests can choose their favourite teams) for a sporty party, or Gingerbread Men for a pirate party. Be aware of any food allergies - it's best to avoid anything with nuts and to offer a gluten-free option. You may also want to offer some healthy snacks, like 'traffic light' fruit pops (balls of watermelon, banana and kiwi fruit on a paddle pop). You could go all out and hire a jumping castle and entertainers or you can keep things simple and go for traditional games that never lose their appeal - especially with younger children. Older kids may be ready for simple crafts like making pirate hats, princess crowns or other novelties. Of course everyone loves to have a go at whacking the piñata to release a shower of toys and lollies. Ideally if you've got a theme you'll want to stick with it (or pick a theme to fit the cake you want to make!). It is always fun to sit with your child and let them pick the cake they would like on their big day. Just click on the Birthday Cakes section of the website, or take a look at some of our custom Birthday Cakes for some inspiration. The best idea when you're putting together a kids goody bag is to set yourself a budget per child and stick to it. Remember that it is fine to tailor the goodies to each child's age - one doesn't have to fit all! Most importantly, remember that your kids birthday party is all about having fun, and that goes for big and little kids alike! Enjoy yourself and let the good times roll!